Each year on the first Saturday of December, we venture out to cut down our Christmas tree. Over the years, we have visited several different tree farms as older farms run out of big enough trees and new farms open for business. 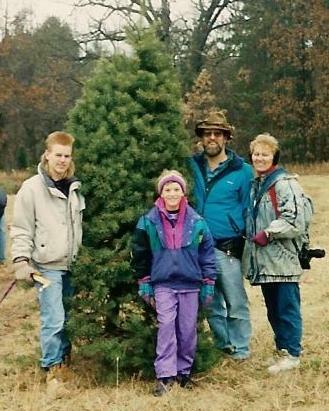 Cutting down the tree was always one of our family’s favorite traditions. The tradition of stringing popcorn and watching It’s a Wonderful Life the night before was, perhaps, not as well-loved by all! When we were first married, our apartment was near a major garden supply and craft center. In late October, we watched as truckloads of Christmas trees were unloaded and stacked in their storage lot. Horrified, we decided to cut our own to be sure it would be fresh (and safe) since our tree goes up in early December and stay up into early January. The next year, I carried our newborn son in a carrier on my chest. There were several years when it was a challenge to carry a snowsuit-clad toddler. As they grew, the children took turns cutting down the tree and helping to carry it. Pictures document each outing. As we decorate our tree, the adults always enjoy warmed Christmas wine from a local winery. Many years, we visited that winery with our freshly cut tree tied to the roof of the car. Now, we make a point of having the wine in house ahead of time. Once, in the throes of an addition to our home, we couldn’t spare the day to make the outing. In our thirty five Christmases together, it was the only year we didn’t cut down our tree. What had started out as an adventure for the two of us grew to three and then four. Now there are just two of us again. In coming years, we hope to share this tradition with our grandchildren.